A Hall of Fame outfielder who was at his peak during the 1950s, Duke Snider is best remembered for his time with the Brooklyn Dodgers. This top ten list examines his earliest releases as well as Snider's later cardboard appearances to find the perfect mix of memorable, valuable, and collectable cards. 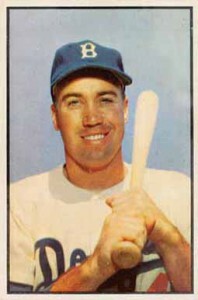 Duke Snider debuted with the Dodgers in 1947 and was featured on his first baseball card in Bowman's 1949 set. He would become one of the most popular players of the 1950s due to his home run-hitting artistry and he would end up with more home runs than any other batter during the decade. Snider made appearances in nearly every early Bowman and Topps release except 1955 Bowman and 1953 Topps, so collectors have many options to choose from when purchasing his older vintage cards. 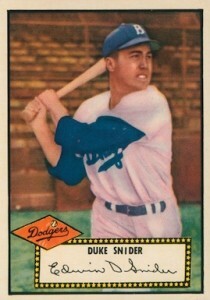 Shop for Duke Snider cards on eBay. 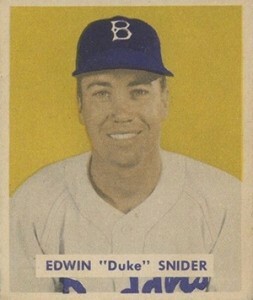 Snider played 16 seasons with the Dodgers in both Los Angeles and Brooklyn where he was the "Duke of Flatbush." Casual collectors may forget that his last two seasons were played with the New York Mets and San Francisco Giants. Mets fans can pick up Snider's 1964 Topps card which featured him sporting the teams blue and orange cap. His season with the Giants was never immortalized on a trading card. After retiring from baseball, Duke Snider became a play-by-play announcer for the Montreal Expos. As a result, there is a card from the 1976 SSPC set that features Snider in an Expos jersey. He was also the subject of the 1984 Donruss Diamond King puzzle, which collectors could put together three pieces at a time with each wax pack they ripped. For collectors on a budget, the 1990's offers many reprint sets that include Snider's key early cards, offering them a chance to own copies of his rookie cards for pennies on the dollar. Snider passed away in 2011, giving his autographs and memorabilia a value jump. Almost all of Snider's autographs in his later years were on stickers and this has allowed sets to continue to include his autograph years after his death. As late as 2013, Topps was issuing Duke Snider autographs as a replacement option through their redemption program and his autograph was also included in 2014 Topps Supreme. Additionally, Snider remains a popular inclusion in modern base sets and you can find his cards in 2014 Topps products like Allen and Ginter, Gypsy Queen, Finest, and Stadium Club. Collectors should use this top ten list as a template to build a strong Duke Snider collection that puts a focus on variety and value. The list also takes into account the historical importance of the cards. Fans of the painted art designs found in Donruss Diamond Kings or Upper Deck Masterpieces should also turn their attention to the 2003 Topps Gallery set. Original art pieces, like the painting of Snider at Ebbets Field, are combined with jersey and bat relics to create some very unique memorabilia cards. I personally enjoy the color spectrum that runs down the side of these cards. 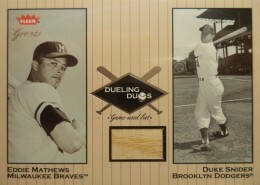 The Dueling Duos relics from 2002 Fleer Greats of the Game combines famous player rivalries and offers individual relics from both players on separate cards, but using the same design. The card featured below has a Snider bat relic and an alternate version of the card features an Eddie Mathews relic instead. Snider was also included on Dueling Dues relics with Ralph Kiner and Bob Gibson. 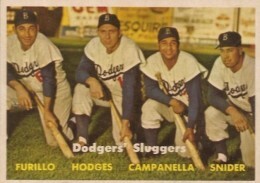 What an amazing card featuring Gil Hodges, Roy Campanella, Duke Snider, and Carl Furillo. Collectors unfamiliar with Dodgers' history may not know of Furillo, who played right field for them for 15 seasons. He was a solid hitter, notching nearly 200 home runs in his career and leading the National League in batting in 1953 with a .344 average. Gil Hodges, possibly one of the biggest Hall of Fame snubs ever, was second in home runs over the course of the 1950's, hitting 16 less than Snider. 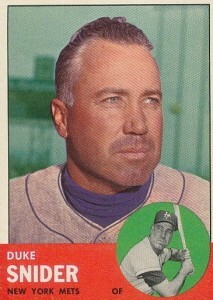 Duke Snider's nickname was "The Silver Fox" and his 1963 Topps card finally gave collectors a look at his silver mane. 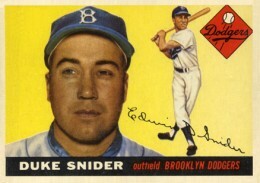 Although the card lists Snider as playing with the New York Mets, he's clearly still wearing the Dodgers grey uniform in the main photograph. In 1994, Nabisco began offering the opportunity to customers to receive autographed cards from some of the all-time great players for $5 and some box tops. Snider, along with Hall of Famers such as Brooks Robinson, Ernie Banks, Jim Palmer, signed many copies, yet it holds its value as one of the rare opportunities to get a certified on-card autograph for Duke. If you are interested in picking up this card, be sure to get a copy accompanied by the certificate of authenticity that Nabisco included with the autograph. Combining two Hall of Fame players on one card tends to make for a great card and it benefits from the overarching rivalry between the New York Giants and Brooklyn Dodgers. Or check that, as both teams abandoned the East Coast for California in 1958. 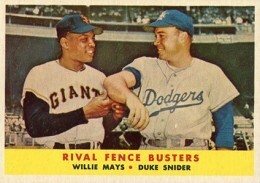 While Willie Mays excelled in San Francisco, Duke Snider's impressive production at Ebbets Field did not carry over to the team's new home stadium, the Los Angeles Memorial Coliseum. A beautiful card, it benefits from the minimalist design that makes 1953 Bowman Color legendary. Snider's full-color debut is also found in the set's high-numbered series, resulting in even mid-grade cards reaching into the hundreds at auction. 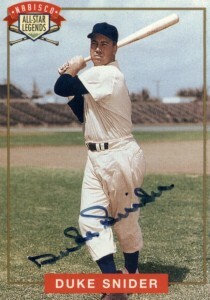 While all of Snider's autographs found in modern sets are signed "Duke Snider," which was the nickname his father gave him as a child, the facsimile signatures that were included in the early Bowman and Topps sets feature his full name, "Edwin D. Snider." The signature line was the key addition to the 1954 Bowman set when compared to the 1953 set that only featured the player's photograph. Although it is not a card from Snider's first few years, Snider's 1955 Topps card is still highly valuable. Topps placed Snider as the last card in their 1955 set, making it yet another card that is extremely difficult to find in high-grade condition. 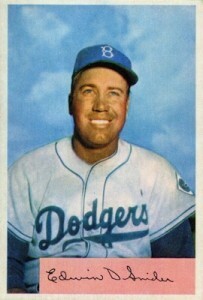 Besides having a sought-after baseball card, Snider was lighting up the National League in 1955. He was the RBI leader and finished with the most runs. Despite this, Snider was second in the MVP voting to his teammate Roy Campanella. Because Duke Snider has a card in the first series of 1952 Topps, finding examples above Very Good (VG) condition is rare. The first and second printing of 1952 Topps featured a black back and the third run changed that to a red back. Topps must have printed many more cards in the third run as red-backed cards severely outnumber the black-backed version. This makes a black-backed Snider card in high grade one of the Holy Grails of the set. The 1949 Bowman set utilizes an interesting way to get around the technical limitation of producing color photographs on trading cards. The set showcases black-and-white photographs for the players and adds a printed a layer of color on the player's uniforms and background. 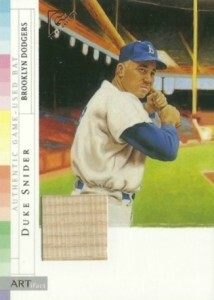 Snider's rookie card is the second most valuable card in the set, sitting just behind Satchell Paige's rookie card. Great article. And thanks for the note regarding Hodges and his HOF snub. As a big Hodges fan and advocate for his HOF induction, which is looking now like will never happen, it is nice to see other baseball folks out there make a mention of Hodges and the great injustice that happened regarding the HOF.